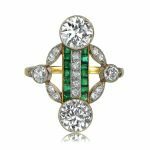 When we see a ring that’s elongated, it’s easy to assume that it’s a cocktail ring or modern fashion jewelry. This isn’t always the case. Some of the most important diamond engagement rings are elongated. 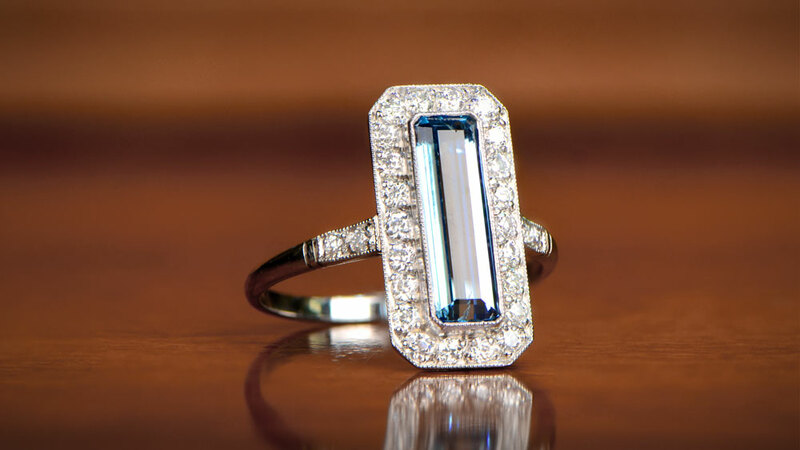 Elongated diamond rings have been around for as long as craftsmen have been working precious stones into wearable art. They started to come to prominence in the mid 19th Century, but really flourishing later on. 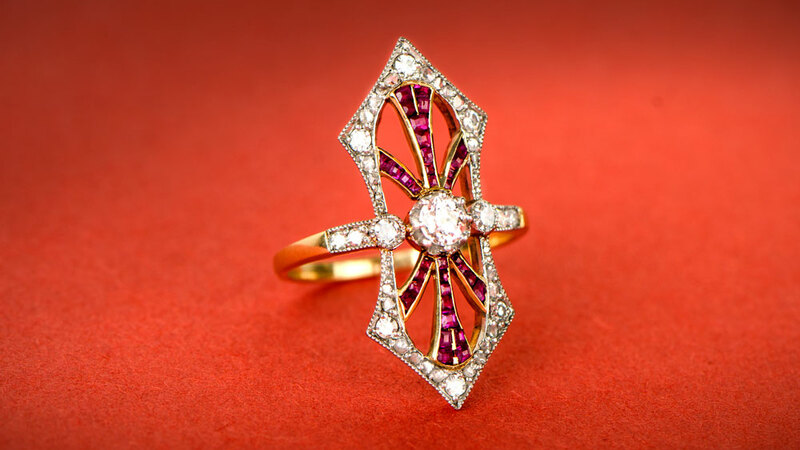 It was during the Nouveau and Deco Era that high-quality diamonds were fully integrated in this manner of design. An Elongated Ring is a ring that extends beyond the usual distance in a North-South direction. When worn, an elongated ring will fall lower down the finger than a common ring. There are no predetermined measurements of what is considered “elongated”. If the ring extends much more than a regular ring it is “elongated”. Although size is important to both, the main difference between elongated cocktail rings and regular cocktail rings is that cocktail rings can be any shape whereas elongated rings must be exactly that – elongated at a 90-degree angle to the line of the band of the ring – so that the design runs along the length of the finger. Occasionally, a ring will appear that has the elongation that protrudes across neighboring fingers. This ring is not a true elongated ring. It really should be described as a cocktail or fashion jewelry. 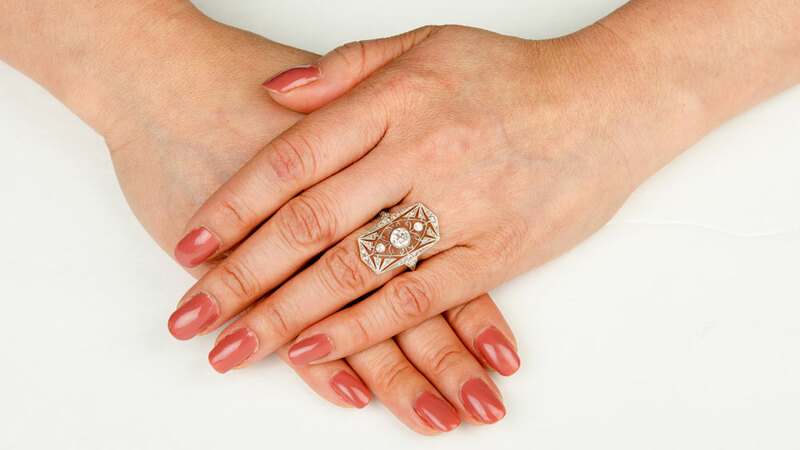 Elongated diamond rings became quite popular during the Art Nouveau period. since they were able to perfectly suit the floral, flowing curve motifs of the period. With Elongated Rings, designers could exercise their creative ideas outside the standard conventions of ring design. 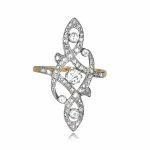 The elongated style enabled the inclusion of long, elegant swirls of diamonds and other stones. It also meant that rings could be designed to have a 3D-like effect. Twists and turns became possible instead of the conventional round and radial settings. Because of the natural separation of the elements possible in an elongated ring, the design also allows for fantastic color combinations. Designs that might well look cluttered on a traditional ring and simply incredible on a longer design. 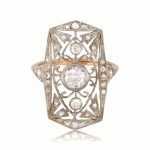 As the early 20th century moved on into the Art Deco period, the style of elongated engagement rings moved with it. These changes weren’t perhaps quite so great with elongated rings as they were with other ring designs, but they are noticeable nonetheless. Although the sweeping curves and flora motifs were largely dispensed with, the stretched setting meant that the Art Deco styles of symmetry and sharp angles could be accommodated in a slightly more subtle way. The designs are much more wearable. The elongation didn’t include elaboration but rather focused on simple but symmetrical form. Elongated diamonds and long proportionate openwork filigree became the order of the day. Filigree also played an important part in elongated ring designs of the early 20th century. The longer the ring, the more stones that needed to be set. The more and the greater the expense. In order to reduce the costs, filigree would be incorporated to allow for a more structured and open setting. 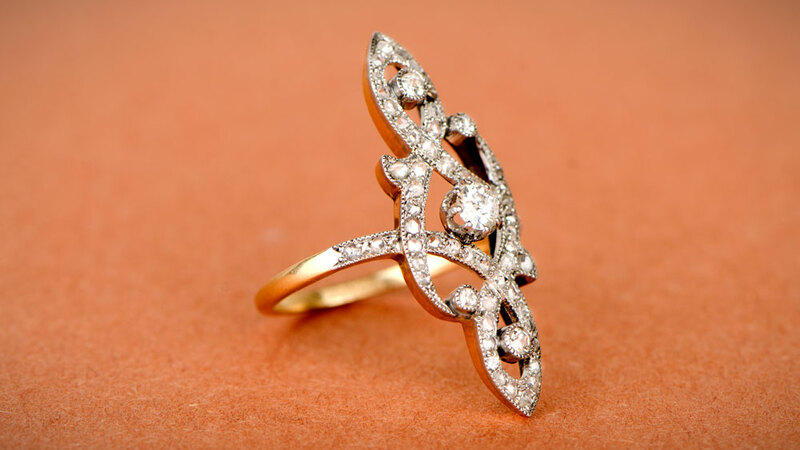 The filigree would help reduce the number of diamonds that was included in the finished piece. 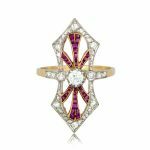 Filigree also allows the designer to show off their other skills, and shift the focus slightly from the gem cutters who were usually the stars of the show! Elongated diamond rings have remained popular today. 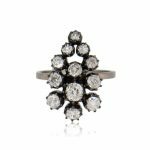 As the jewelry and other personal decorations such as tattoos or piercings have become much more mainstream, so the willingness to be bold and daring with everyday jewelry choices has grown alongside. The use of antique elongated rings makes for a much more stylish alternative to the often garish “bling” culture which sometimes dominates the fashion end of ring wearing. 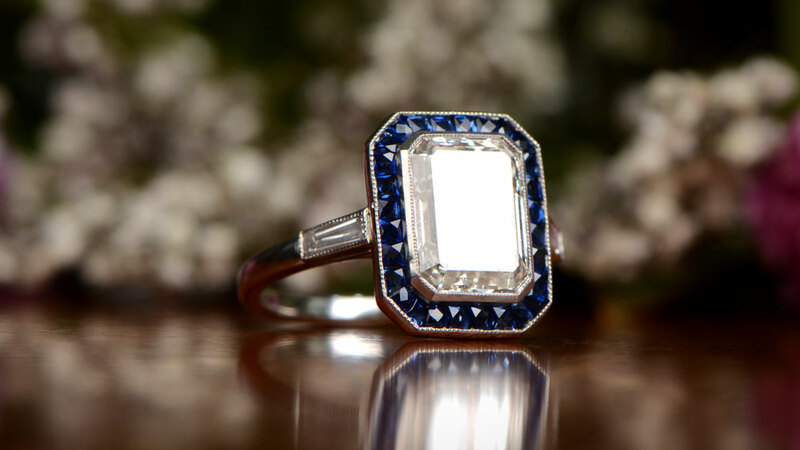 Even traditional engagement rings are now starting to feature elongated influences. Elongated cushion cut diamond rings and elongated emerald cut diamond rings are best sellers.